Sign up by May 15 to volunteer to judge up to 10 award applications. Interested in presenting a Professional Development Workshop at the 2019 NAAE Convention? Submit your proposal by June 3, 2019. The 2019 NAAE Award application, details, rubrics, and instructions are now available. Online submission will be available soon, stay tuned. Join us for this summer's NAAE Virtual Book Club as we read "Make Learning Magical"! Early Bird registration and the housing block for convention are now open. We hope you will join us in Anaheim! 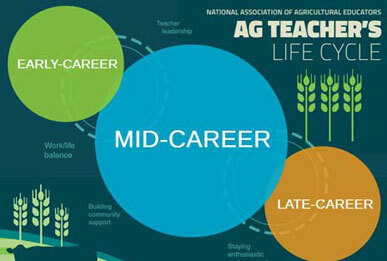 Find information for NAAE Regional affiliates and state agricultural educators associations. Learn about NAAE programs, opportunities benefits just for NAAE members. NAAE Regional Conferences are just around the corner. Make sure to register to attend these great networking and professional development opportunities. 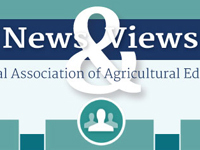 All this and more in the April edition of News & Views! Remit dues for your state, join as an individual, or as an organization. Who is representing you? Find out who your elected leaders are and how you can contact them by visiting the Legislative Action Center, provided through a partnership with ACTE.